There is a new "Badminton 4 Everyone" session starting at Turton Sports Centre. 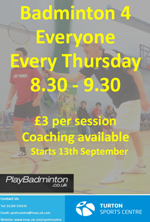 Sessions take place every Thursday from 8:30 - 9:30pm and cost only £3 with coaching available. For more information get in touch with the Sports Centre by ringing 01204 334191 or visiting www.tmac.uk.com/sportscentre.